A multi-sketch satirical one-hander in the tradition of Bafana Republic, that premiered in 2016 at the National Arts Festival and won its performer, Daniel Mpilo Richards, the Naledi Theatre Award for Best Newcomer and a nomination in the Best New Script category. After working with Daniel Richards on Born Free, I realised how talented he was. So I promised him that I would write a multi-sketch revue that would showcase his range of skills. And so, Pay Back the Curry was born. Both Siv Ngesi, who offered to produce it, and Dan wanted to work with Rob van Vuuren as the Director, and that’s how the creative team that would work on three editions came into being. We aimed to launch Pay Back the Curry on the Fringe of the National Arts Festival in 2016. Prior to that, we developed the piece by showcasing it to various audiences ranging from Franschhoek, Rosebank and Kenilworth, to Khayelitsha and Delft. We asked audiences to complete questionnaires to give feedback to the show, which helped us to amend sketches, sometimes replacing sketches with something completely new and re-ordering the sketches. Everywhere we went, people were blown away by Daniel’s talent and skills. 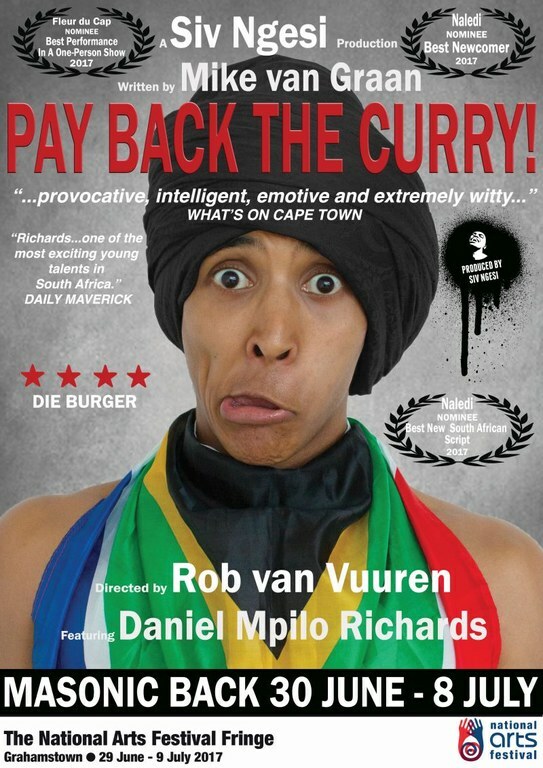 By the time we got to premier the show in Grahamstown, word of mouth had spread so that our first show was sold out and so was every one of the subsequent nine shows, a most unlikely feat for a new show on the Fringe. (After one-off development shows at the Franschhoek Literary Festival, Kenilworth, Rosebank, Khayelitsha Shack Theatre, Delft Rainbow Arts Organisation). The script is available on this site, and is likely to be published along with State Fracture and Land Acts.